Our passion and commitment as Foodservice providers is to share the unique taste and superior quality of Indian basmati rice. We have become the rice of choice for world-class chefs, top-tier restaurants and premium food service establishments alike. Today, Royal® is America’s #1 Basmati Rice with a reputation for unparalleled excellence. Our extensive product line also includes couscous, flour and oil with the same high standards for quality. With our years of experience, we understand the unique needs of the foodservice industry. Our authentic Royal® Basmati is grown in the foothills of the Himalayan Mountains, under the attentive care of India’s farmers. After harvesting, we take the time to age it for a full year, which enhances the flavor and texture. The result is a delicate and nutty grain that has earned its place as America’s favorite. 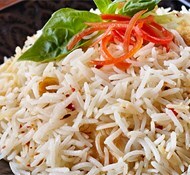 This is the world’s longest basmati, expanding up to 2½ times its raw length when cooked. With its brilliant white luster, fragrant aroma and distinctive flavor, it is a culinary showstopper. Professional chefs love to cook with this steamed rice and value its delicious taste, texture, higher yield and appetizing appearance. For added convenience, we offer Royal® Chef’s Secret Sela—a parboiled, easy-cook rice. This variety requires no soaking and can be kept warm for extended periods without compromising flavor, consistency or color. Our flour is made with the famous Sharbati wheat grown in the state of Madhya Pradesh in India. This premium wheat is healthy, nutritious and a good source of fiber. 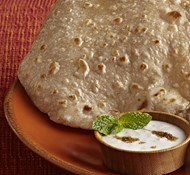 It is perfect for making chapatti, paratha and puri Indian breads. Pressed from the finest European wine grape seeds, this remarkably versatile oil has a clean, light taste that never overwhelms delicate foods. Many chefs prefer GrapeOla® for its high smoking point (420°F), which allows it to be safely used for deep-frying and sautéing. If you’re interested in becoming a food service customer, please contact us or call us at 1-800-550-7423.